The annual festival is a Chinese Lunar New Year celebration where students show off their Mandarin proficiency and celebrate Chinese culture and dance. 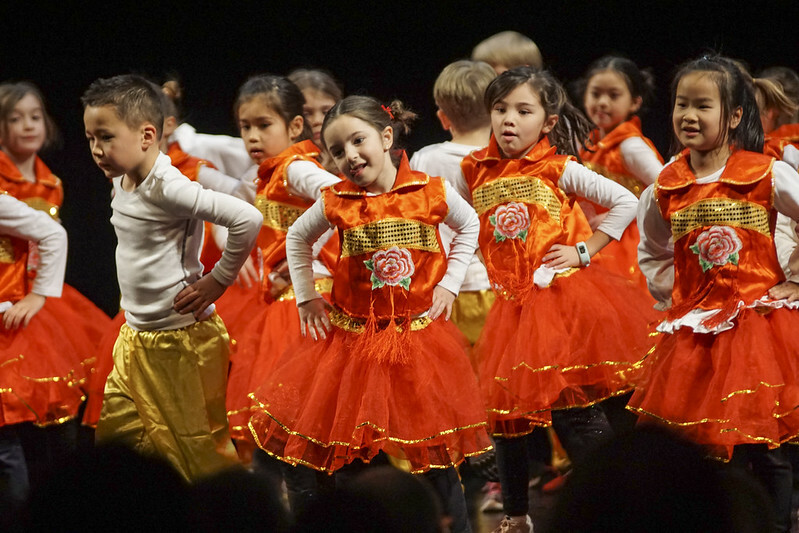 XinXing students performed for a packed auditorium at Hopkins High School on Feb. 5 to celebrate the Chinese New Year, the most important holiday in Chinese culture. The festival is tied to the Chinese lunar calendar, and this year marks the beginning of the Year of the Pig. The production was completely choreographed and scripted by teachers. Students spent hours practicing intricate routines for the event. Kindergarteners kicked off the celebration with a few songs and a coordinated dance. Grades 1 through 4 followed with a number of songs, Chinese martial arts, a drum sequence, other choreographed dances, and more! XinXing Academy is a Chinese immersion program that is housed at Eisenhower Elementary School. All core subject matter is taught in Mandarin Chinese for the full day in grades K-2, with an even distribution of English and Mandarin by grades 5-6. The program continues on at West Junior High and Hopkins High School.